SAVANNAH, Georgia — The business, art, and transactional legitimacy of reporting is to recognize that everything is connected. That’s especially true when your beat is global, your opportunity is unlimited, and your bank account is a like a hungry fledgling fish hawk. Case in point: this article on the Savannah port’s increasing traffic which was posted today in the New York Times. 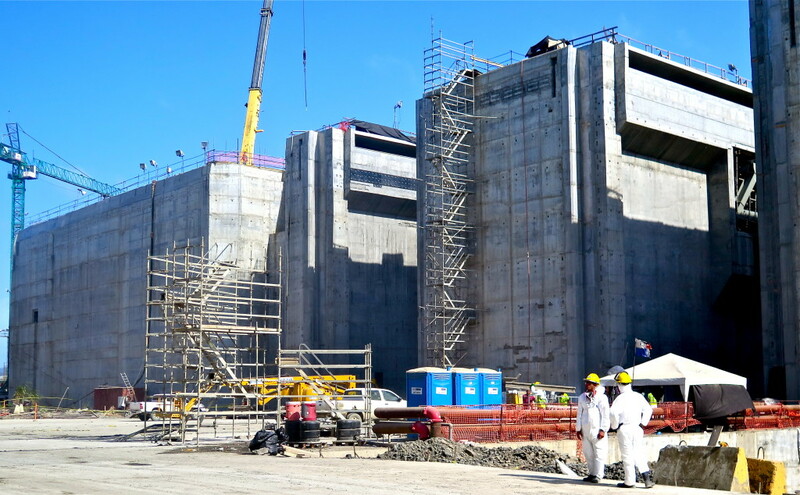 Much of the port’s success is wrapped around its anticipation of the opening next year of the new and much larger locks at the Panama Canal. I reported that story and a number of others about Panama’s economy, and energy and water resources, for Circle of Blue earlier this year. That grouping of articles also included a piece from here that described the mismatch in U.S.infrastructure investment between port spending and spending for water supply and treatment. I learned about the Savannah port’s expansion and its relationship to the Panama Canal expansion from an engineer in New York. The link was confirmed during the month I spent in Panama in January. It was only logical to visit Savannah as soon as I could, which was in mid-February. I found that the business of marine transport here at the nation’s fourth largest container port is a study in visible statistics. Thirty-one ocean-going container vessels berth at the nearly 10,000-foot-long Garden City terminal each week. More than 8,000 trucks arrive and depart from the terminal daily. Garden City handled 3.34 million, 20-foot containers last year, over 10 percent more container cargo than in 2013, and a record. There are other numbers that are just as vital to Garden City’s growing business, but not nearly so visible. Hidden behind the green curtain of Georgia pine forest that surrounds the terminal are 45.3 million square feet of logistics, storage, and distribution centers, according to the Georgia Ports Authority, the terminal’s owner and operator. Owned, leased, or managed by some of the most recognizable brands in the country – Wal-Mart, Ikea, Home Depot, Target, and Pier 1 Imports – the immense buildings are essential links in the flow of farm, construction, and manufactured products streaming out or into the country through the Savannah River port, one of the country’s most modern maritime transport installations. Garden City’s traffic, which includes everything from containers of frozen Georgia chicken parts heading to Asia and stuffed doggie beds coming in from China, is about evenly divided between exports and imports. The largest distribution center is the 2.5 million-square-foot facility owned by Schneider Logistics, a unit of the national trucking company. Wal-Mart operates a 2 million-square-foot center in Statesboro, 55 miles west. Both are expansive enough to completely enclose two typical suburban shopping malls, or all the businesses in Savannah’s historic downtown, which lies just downstream. There are sufficient numbers of large forested parcels near Savannah to build 35 million more square feet of distribution space. OA Logistics/JLA Home, a subsidiary of the privately-held, California-based E&E Company, announced plans in January to build a 1.1-million square-foot e-commerce fulfillment center near the port. The Garden City terminal, according to the Georgia Department of Economic Development, also is influencing distribution center construction up to 250 miles away. Bed Bath & Beyond in 2014 opened a $50 million, 810,000-square-foot distribution center in Jefferson, northeast of Atlanta and 230 miles away. Wal-Mart is constructing a $102 million, 1.2 million-square-foot distribution facility in Union City, south of Atlanta and 250 miles from the Savannah port. Demand for new warehouse and distribution space is intensifying, said John F. Petrino, director of business development for the Georgia Ports Authority. Vacancy rates, which were as high 18.6 percent in 2009, dropped to 5.4 percent last year, according to the port. That occurred even as 11 new or expanded distribution centers, enclosing more than 3 million square feet, opened last year in or near Garden City, said the Ports Authority. They account for 1,950 new jobs. On a tour of the region by car, Petrino pointed out facilities, empty or nearly so as recently as 2011, that were operating at full capacity in 2014.“The economy is recovering and you see that in the amount of freight moving through these buildings,” he said. There are several more factors leading to the flurry of activity in Garden City’s distribution center market. Perhaps the most significant is the expansion of the Panama Canal, a $6 billion project to add a third set of much larger locks to enable bigger container ships to navigate the maritime shortcut across the isthmus. 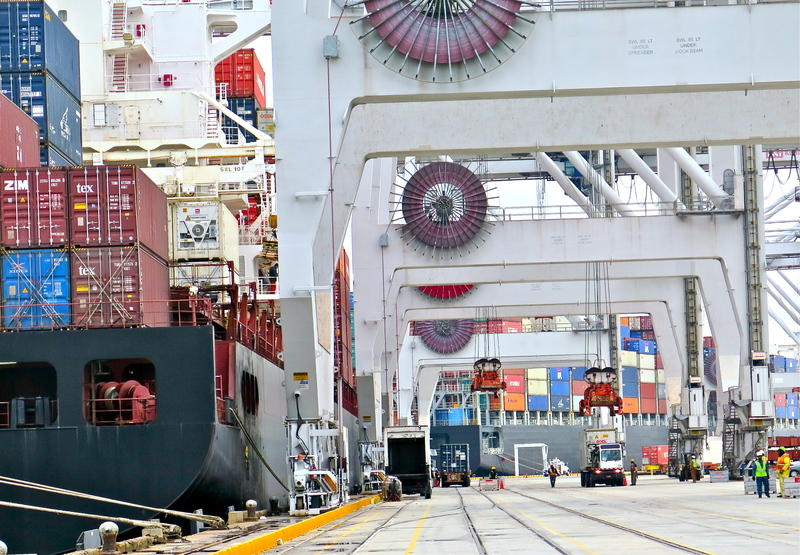 The canal expansion, which is scheduled to open for commercial traffic in 2016, is expected to double, from 330 million to 660 million metric tons, the volume of goods making the 50-mile crossing each year, said the Panama Canal Authority. Two-thirds of that traffic is dispatched or received by American ports along the Gulf of Mexico and Atlantic coast. Georgia and its state-owned Ports Authority, anticipating the growth in canal traffic, spent a decade and $758 million to improve highways, purchase new cranes, improve rail connections, and reconstruct the terminal ramps and traffic patterns to compete for more of the canal traffic. 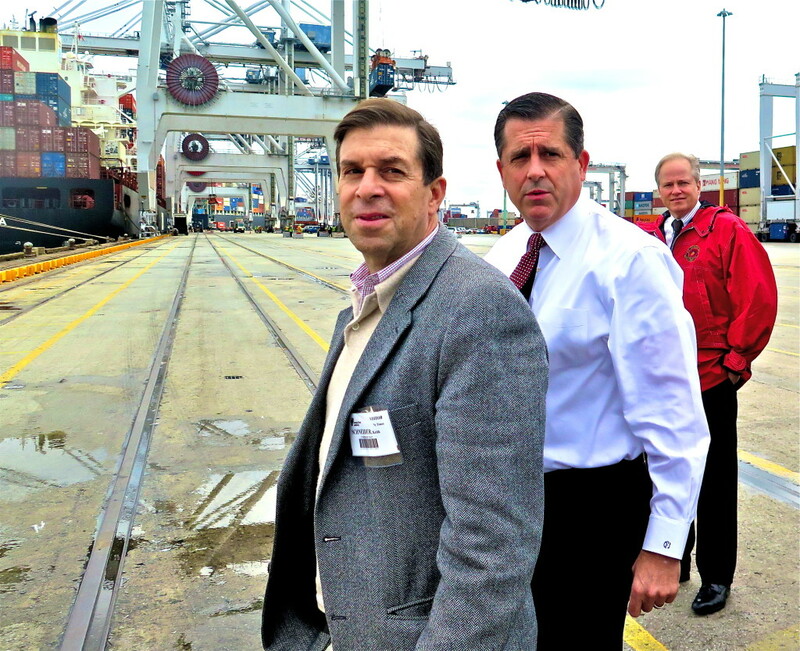 The latest improvement is the $706 million state and federal project to expand the port and deepen the Savannah River. Dredging started this month. Georgia’s share, $266 million, was approved by the Legislature. Congress authorized the federal share in a water bill last June. President Obama requested $42 million for the project in this year’s budget proposal. Georgia Governor Nathan Deal, a Republican, has repeatedly told reporters that he is confident Congress will approve the request. Such fiscal transactions, largely distanced from public attention, are characteristic of the operations at the logistics and distribution centers here. Unlike the container terminal, with its enormous ships coming and going, and its trucks and cranes operating with almost antic urgency, the immense distribution centers aren’t visible at all. It takes a veteran guide like John Petrino to navigate the building sites, which generally range from 50 to 100 acres, and are hidden by deep screens of mature pines. Encountering a million-square-foot facility, half-a-mile long and 400 yards wide, is like emerging from the dark locker room tunnel to confront towering tiers of stands in an NFL stadium. Companies are leery about opening the interior of their buildings to public view. Mr. Petrino explains that the newest facilities harbor automated product movement and fulfillment equipment that are proprietary. Profit margins are so slim, say operators, that systems for storing freight on tall and very long shelves, and techniques for organizing boxes on warehouse floors, are tightly held. 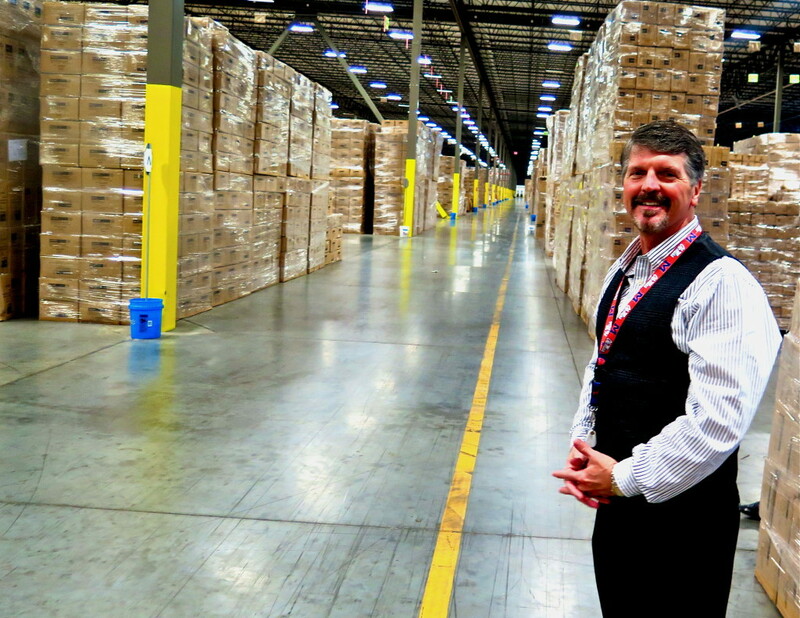 Rodney Dickey, the president of OA Logistics, noted these features of the business while walking through the company’s 679,000-square foot distribution center. Electric and propane-fueled forklifts whirred through the building, which has a 32-foot ceiling, is longer than a five-stroke golf hole, and smells like new cardboard. A portion of the building contains a printing shop for art sold by the import company. Another portion is an area for Chinese-made products that require final assembly and packaging. One hundred and ten people work in the 11-year-old building, housed on 41 acres, which the company purchased in 2009 for $28 million. A new distribution center costs $42 to $55 a square foot to build, plus the price of the land, which is usually over $100,000 an acre, says Mr. Dickey. In the expanding import market such expenses are unavoidable and a sign of business strength, he says. The company’s new 1.1 million-square-foot center, due to start construction in the spring on a 150-acre site nearby, will house state-of-the-art fulfillment equipment for the parent company’s Designerliving.com e-commerce business.